Birthday equals cake it is as simple as that! 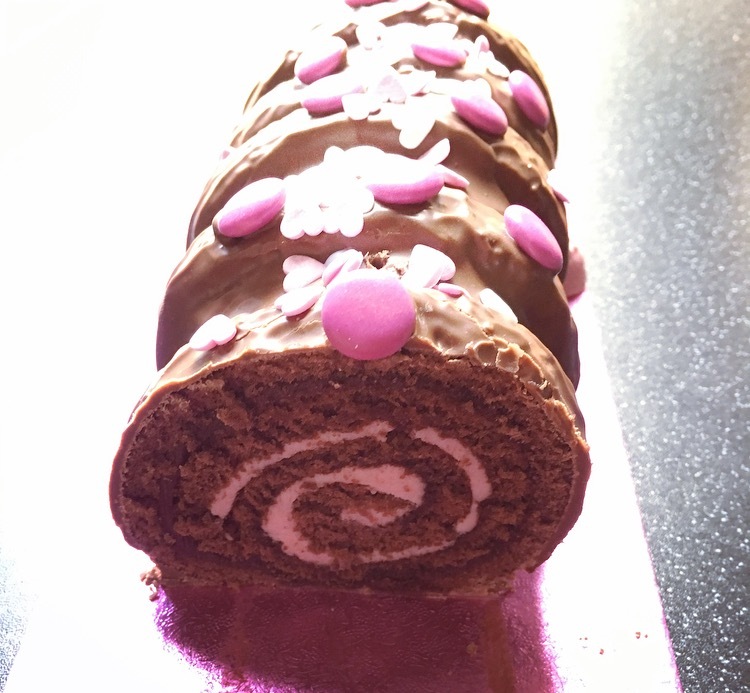 Over the last year we have had the bitterly disappointing Jammie Dodger Cake and the sweet and little dry Cadbury Chocolate Flake, so this month we decided to stick to the good old chocolate cake and went for the new M&S Connie Caterpillar Cake. Colin has gone and got himself a girlfriend and isn’t she just oh so pretty, look at that beautiful face with enviable eyelashes. 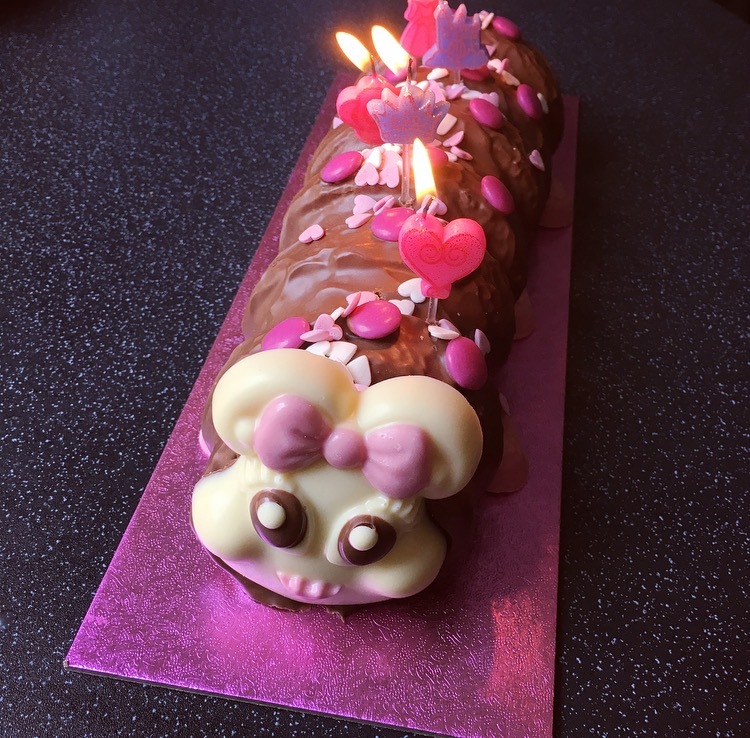 The Caterpillar cake is the pinnacle of birthday’s, Colin is of course the undisputed King; even Mr Beckham indulged in him this year! 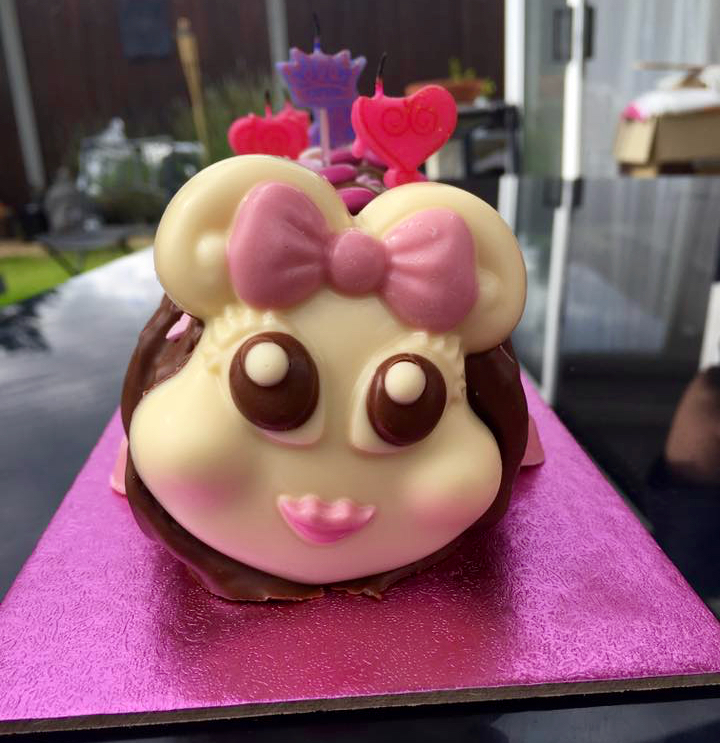 Colin certainly takes me back to my childhood so naturally when M&S released that they were doing a new addition, I had earmarked it as a must buy for the Mum’s Birthday, really it is all about what cake I want and nobody else!! 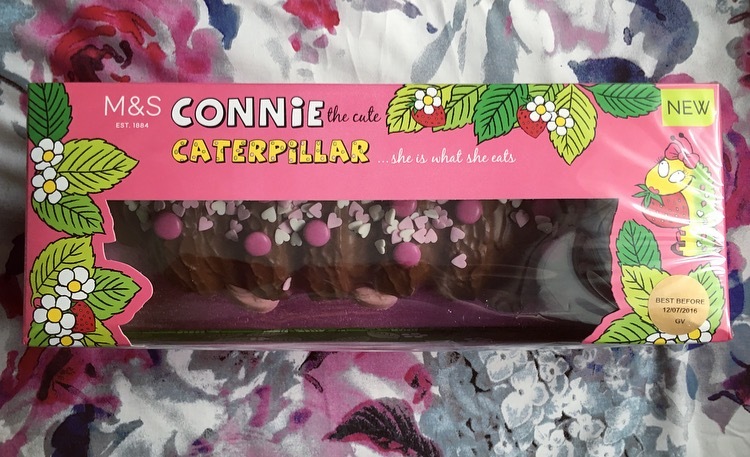 Connie Caterpillar is a reasonable £7.00 and supposedly serves 10, which it will if you wish for only a slither. Unfortunately slithers of cake do not exist in our house, it’s a slab and only a slab. Connie still has that chocolate sponge but, in a fruity twist, she is also filled with strawberry buttercream, is topped with sugar hearts, pink smarties and has pink footsies. Cutting a slice the chocolate had that glorious snap and inside I was greeted with a swirl of pink perfection and the whiff of strawberries. The chocolate is by far the best quality chocolate I have ever had for a basic chocolate cake. For starters it actually tasted of chocolate rather than that chemically fake twang most have. The sponge was bouncy and light with not a single dry crumb in sight. The tight buttercream swirl was thick and creamy and served as the perfect ratio with the cake and chocolate coating. 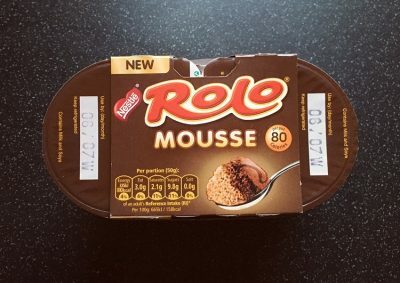 The strawberry flavouring was spot on strawberrylicious, and although a subtle flavour it certainly held its own against the chocolate upon chocolate. The cake as a whole is pretty sweet but then what is a birthday without a sweet treat? Dare I say I love Connie more than I love Colin!! It really is the the strawberry buttercream that sets this above the rest. 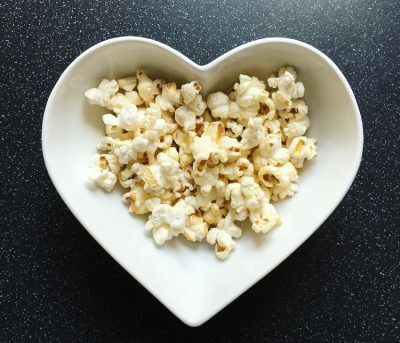 It is a marvellously tasty strawberry flavour that gives it that lighter feel than having just chocolate upon chocolate upon chocolate, and really anything decorated in pink smarties and hearts, AND served on a pink sparkly board is going to get my vote! A must try and my oh my I really do hope that cute as a button Connie Caterpillar is here to stay!